I made these cupcakes to serve as both the centerpiece and dessert at a baby shower this week. I created the "blossom" look by using various star decorating tips and basically squeezing a blob of frosting out then slowly releasing pressure and lifting up the icing bag at the same time. So simple. The roses are just spirals using a large star tip. 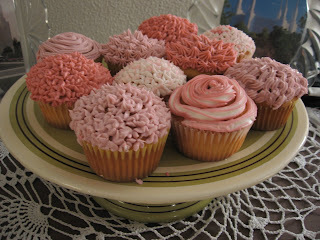 The variegated color comes from first adding pink frosting and then white to the icing bag. Easy and pretty, can life get any better!? !